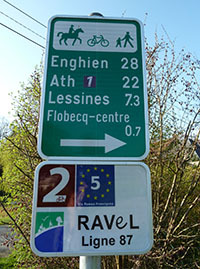 EuroVelo signage is easily recognised, but not all panels are already fully installed. This is planned to be finished by 2020. 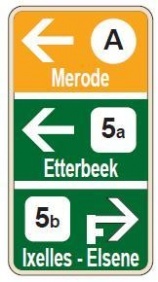 If the EuroVelo panels are not yet set up, you can follow regional signs. 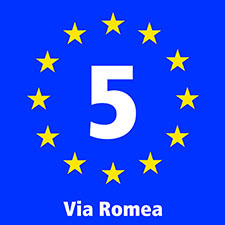 Below are some examples of signage which you can encounter along the EuroVelo 3 and 5. The route is easy to identify and follow thanks to signs which bear the distinctive EuroVelo logo and are clearly marked and visible along the route. 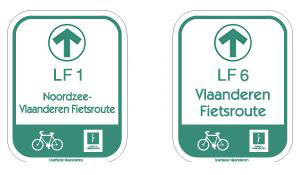 The LF routes form a network of long-distance cycling routes in Flanders. They are identified by a name and number, while the suffixes a or b indicate the route’s direction. More info about FL routes (in French and Dutch). 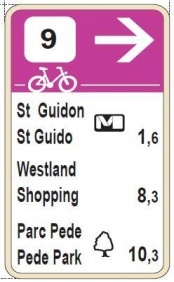 The Brussels’ regional bike route network is made up by the Regional Cycling Itineraries (ICR). They are quality cycling paths, composed of 19 different itineraries in the capital region. More info about the ICR (in French and Dutch). Wallonia has implemented a network of bike routes called RAVeL (Réseau Autonome des Voies Lentes). You can access a complete description of the international and regional long-distance itineraries in Wallonia on the RAVeL website. More info on RAVeL (in French).